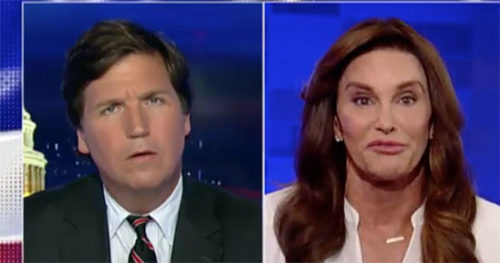 The dumbfounded Tucker Carlson, left, listening intently to Caitlyn Jenner. You made a statement last time when you were with Jillian Weiss, you were coming up with this scenario of, oh, a guy, 35, all of a sudden [says] ‘Hey! I’m trans! I’m going to be a woman now. I’m going to get federal funds for women’s issues.’ That’s totally — that does not happen in the trans community! You are basically born this way. I’ve dealt with this since I was this big [holding her hand far below her chin] it’s not something that’s just a whim. A stunned Carlson said he didn’t mean to imply it was a whim. But he did steer the conversation away from this concept to the fairness of whether transgender athletes can compete against cisgender [non-trans] athletes, with Jenner complaining that she was there to discuss her book. But she spoke in favor of allowing trans athletes to compete according to the guidelines the International Olympic Committee has established, which do not require gender confirmation surgery to be considered a male or female competitor. I’ve been fighting this war for a couple of years and I don’t even think in my lifetime that most people will get it. But we need to bring this subject forward. Why? Because of the youth.